I've always found muffins a bit tricky to bake. You have to be careful not to stir too much and your proportions should be just right - otherwise, you could end up with leaden bricks or gooey messes. 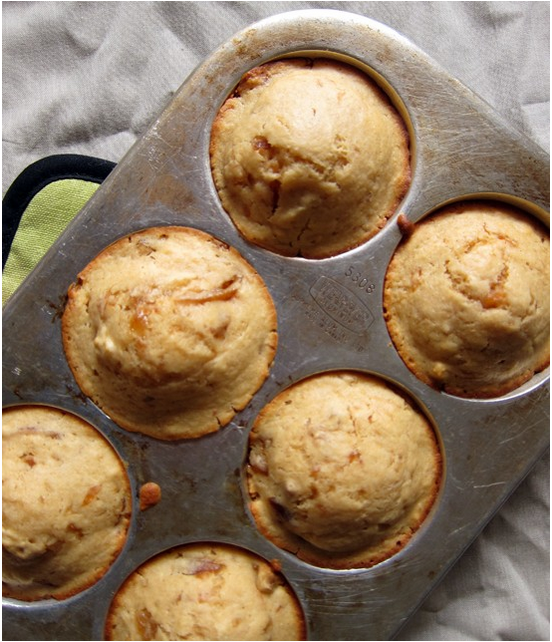 However, these muffins are perfect. Easy to whip up and they are tender and light once baked. I love them. I also love that they make use of all the little jars of marmalade I have hiding in the fridge. Apparently, friends love to share their homemade marmalade with me and I happily accept each precious jar. I use marmalade to give salad dressings kick and baked chicken some tang, but I don't have much of a stomach for it spread over toast. So when I spotted a recipe for jam muffins, I figured why not use marmalade instead? 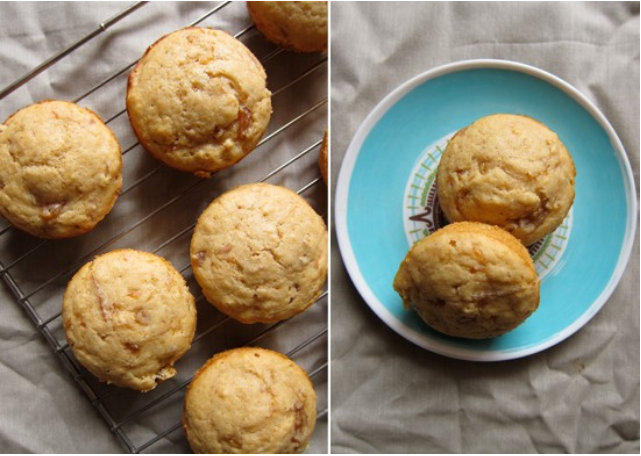 The marmalade gives these muffins a citrus wallop which is a nice perk first thing in the morning. Plus, they go great with morning coffee. I love that they aren't too sweet. Just a bit of honey and the marmalade (or jam, if you prefer) do the trick nicely. I add walnuts for a bit of crunch, but you could leave them out, no harm done. 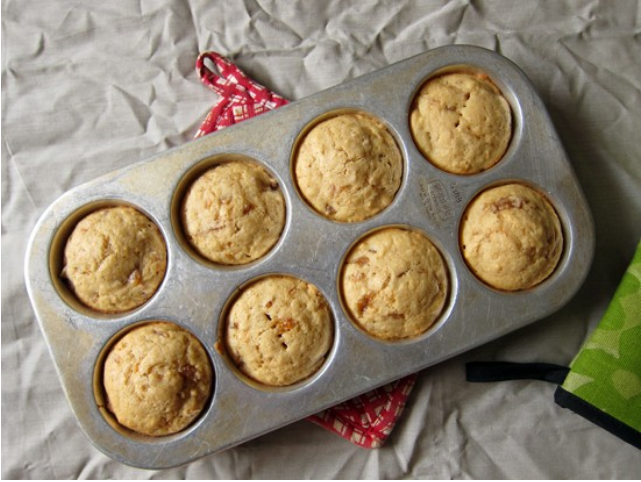 Preheat oven to 375F and grease up your standard sized muffin tin. Whisk together the flours, baking powder and salt in a medium sized bowl. In a large bowl, combine the milk, oil, vanilla, egg and honey together, making sure to fully incorporate all the ingredients. Slowly add in the dry ingredients and slowly mix until just combined. Dump in the marmalade and walnuts (if using) and slowly fold into the batter, making sure to leave the marmalade streaky. 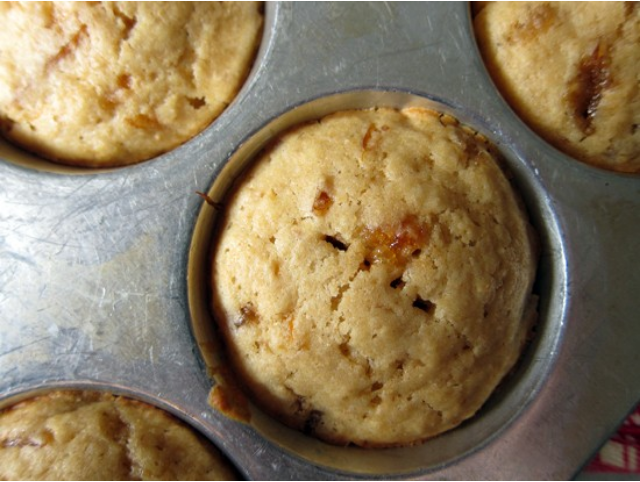 Pour into muffin cups and bake for 15-20 minutes or until the tops are golden and a toothpick inserted into the centre comes out clean. ben de yapmıştım bu kalıplarla muffin. i love starting my mornings off with a cup of joe and a muffin. these look quite yummy! Great idea. I have a jar of Pina Colada Jam that a friend gave me for the holidays. I will try that in the muffins. ahh muffins. will def give this a try now. thanks! I made these yesterday and they are DELICIOUS!!!! We loved them; they are the perfect sweetness, NOT too sweet. I made them in the mini size because I have a diabetic in the house and it is easier with the mini size to control the amount he eats. :) I also used sugar free marmalade, worked perfect. Really lovely muffins! I was looking for a good recipe to use some of the embarrassing number of jars of homemade marmalade that I found lurkIng in the back of the pantry, and these did the trick. I beat the marmalade into the wet ingredients and added a little more whole wheat flour. Yield: 10 tasty treats! Mmm, these are delicious! 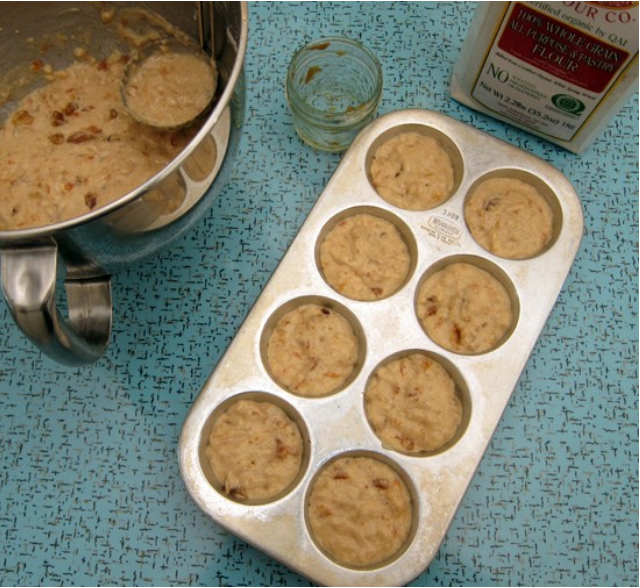 I used a muffin tin with slightly smaller cups and made an even dozen without modifying the recipe.